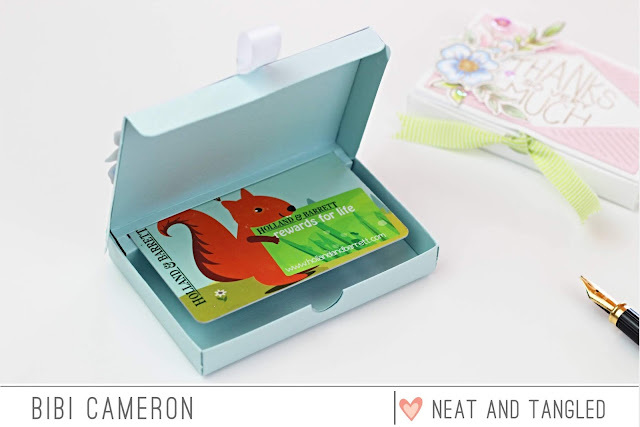 Hello from Scotland, it's Bibi Cameron here and today I'm sharing a video -post with ideas using the new Gift Card Box from the latest Neat and Tangled release and I made a super easy pop-up gift card holder to put inside the box as an extra decorative and useful element. The box measures 3- 3/4 " x 2.5" and it is 1/2 an inch tall. This box is extra versatile and it can be customized for any occasion. It can accommodate a regular gift /reward card and it will be great packaging for small treats, jewellery, mini cards, tags, slim sweeties, chocolates or even money. 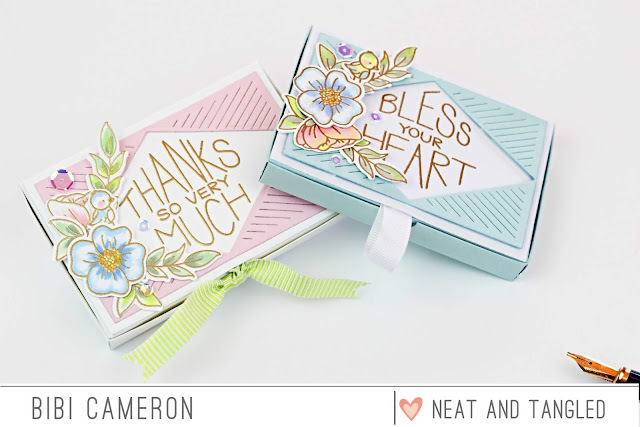 To create the insert for the box above you need a 6" x 3-3/4" or 6" x 3-1/2" inches piece of 240 grams to 300 grams cardstock ( The thicker the cardstock the narrower should be the insert so that it will allow the box flaps to fold down in place and the box can be closed). Fold and glue the pop-up insert as shown in the video. The gift card will remain flat inside the box as shown in the picture. To create the insert in the card above, you need a 6" x 3-5/8" or 6" x 3-1/2 inches piece of 240 grams to 300 grams cardstock. 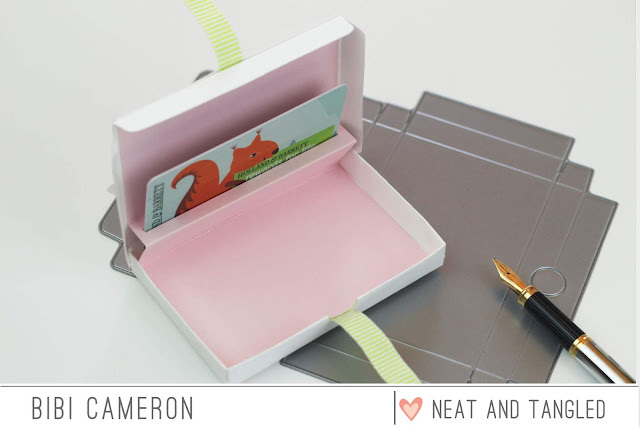 Remember that the thicker the cardstock the narrower should be the insert so that it will allow the box flaps to fold down in place and the box can be closed. Score at 2", 2- 1/2" - 3 1/ 2" fold and glue the paper as shown in the video. The gift card will remain straight up inside the box as shown in the picture. I was keen to try several boxes designs for Halloween, children parties, birthdays, Christmas ... the box is adorable every time. I hope you like the ideas and the projects! That's super creative!! Love the gift card holder! Such a clever insert to further enhance these cute boxes. Love your decorations. Oh my, those are so cool! Cant believe that we are heading to Christmas... I am still all summer in my head at the moment. But it is nice to get an early start for all those holidays projects. Thanks Bibi for the inspiration. September 2018 Release Sneak Peeks! 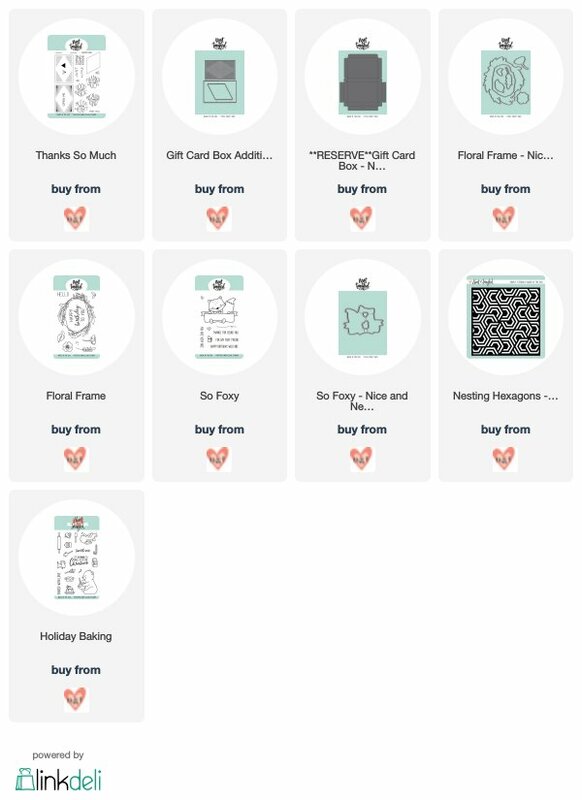 Rubeena's Crafting Anniversary Blog Hop Day Two! 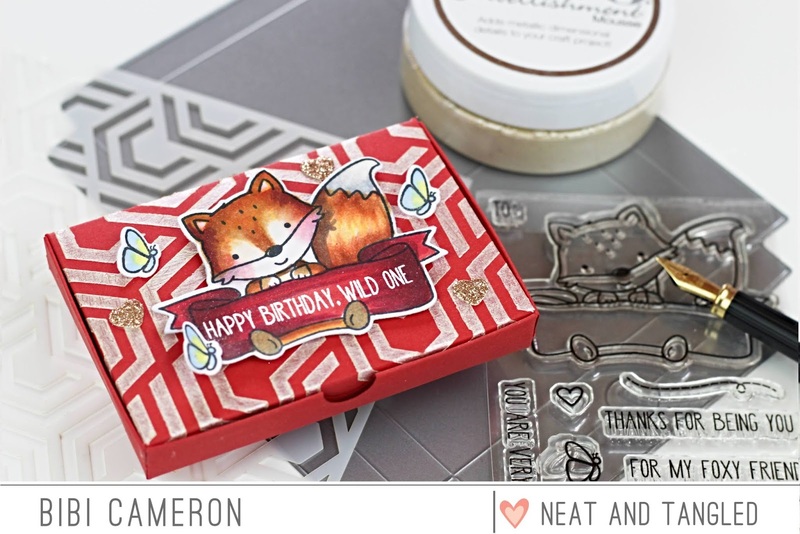 Neat and Tangled Birthday Blog Hop Day 3! Neat and Tangled 6th Birthday Blog Hop Day 2! Neat and Tangled 6th Birthday Blog Hop Day 1!